Tilberthwaite with only two farms High and Low Tilberthwaite is situated at the end of a small but very beautiful valley leading off from the hanging valley of Little Langdale and was once a thriving centre for slate quarrying. The quarries have not been worked for many years and they have left their mark of clean cut walls and deep water filled hollows now covered in deciduous woodland. The valley of Tilberthwaite situated between Little Langdale and Coniston is a very beautiful valley with the pretty Yewdale Beck flowing along the bottom and is surrounded by wonderful scenery dotted with cottages and farms. To the west of the valley lie the Tilberthwaite Fells to the east is Holme Fell to the north is Little Langdale and to the south is Coniston and Coniston Water. Just to the side of the car park there are stone steps leading to Tilberthwaite Gill which is an impressive rock gorge with several wonderful waterfalls, the most impressive one being at the top of the gill at the start of the steep ravine. There are many old mine trails and levels along with the more modern paths either side of the gill which ascend westwards from the car park in Tilberthwaite. The lower part of the northern path is easier than the southern path where some scrambling is expected but the higher part of the gill can become challenging due to large boulders and very steep ground. The path then leads on to the Tilberthwaite Fells, Wetherlam at 762m and Swirl How and also to some of the most popular fells of the Lake District such as Pike of Blisco, Crinkle Crags, Bow Fell and the Coniston Fells including The Old Man. Hodge Close, just north of Tilberthwaite, is an area of interlinked green slate mines and quarries. Originally Hodge Close was the main pit working at over 300 feet deep, half of which is now flooded, with at least seven levels linking to underground slate mines of which three of these are flooded. Hodge Close also breaks into the equally impressive Parrock Quarry via an impressive archway. Tarn Hows or The Tarns is a stunning area of the Lake District attracting thousands of tourists making it one of the most visited places in the Lake District. Tarn Hows, once three smaller tarns (Low Tarn, Middle Tarn and High Tarn) joined together in the late 19th century, is fed at its northern end by a series of valley and basin mires and drained by Tom Gill which cascades down over several small waterfalls to Glen Mary Bridge which gained its name from John Ruskin who thought that the gill required a more picturesque name. 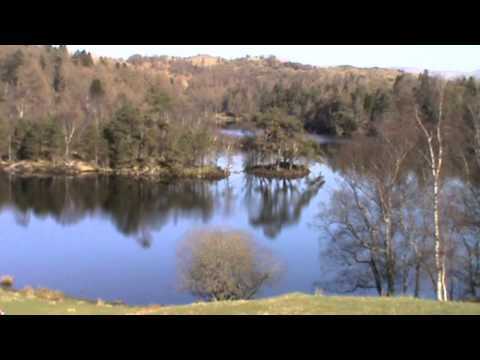 Until 1862 most of the Tarn Hows area was part of the open common grazing of Hawkshead parish the remaining enclosed land and many of the local farms and quarries were owned by the Marshall family of Monk Coniston Hall. The Marshall’s gained full possession of all the land after the enclosure act of 1862 which led to a series of improvements and the building of a dam at Low Tarn creating the larger tarn that it is now. By 1899 the tarn was already becoming a popular beauty spot for skaters in the winter and picnickers in the summer. In 1929 the Marshall family put the tarn and its setting of up for sale and in 1930 the 4,000 acres of land was sold to Beatrix Heelis of Sawrey better known as Beatrix Potter for £15000. She then sold half the land containing the Tarn to the National Trust and bequeathed the rest of the estate to them in her will. The National Trust have since made a number of changes to the area including moving the car parks to a more suitable place in the 1960’s and making footpath and road improvements to help minimize the damage caused by visitors. In May 2008 they opened a building, designed to fit in with the landscape, providing toilets and an information display. Tarn Hows was designated a Site of Special Scientific Interest in 1965. On a summers day this beauty spot surrounded by thick woodland and views towards Wetherlam, the Helvellyn range and the Langdale Pikes is literally pack with people whether relaxing with a picnic or ambling round the tarn. There is a 1.5 mile path round the tarn that is level and well maintained therefore suitable for wheelchairs and pushchairs. From the car park we turn right and walk down the road for just short of a mile to the main Coniston road. We turn left and walk along the path at the side of the road for a short way to a small car park. We cross over the bridge and turn right through the gate sign posted Yew Tree Farm ½. We follow the track and turn right following the blue arrow on a wooden post in front of the wall down to the road and Yew Tree Farm. We turn left along the road for a short way and turn right onto the track just to the right of the car park and then bear right heading uphill for a short way. We then go through a gate on the left and keep following the path uphill going through two more gates. At the third gate we head forwards and Tarn Hows comes into view. We head down to the lake and follow the track to the left hand side. When we reach a sign post we bear off left towards Arnside and Langdales. We continue forwards to a gate where we turn right and follow the track towards a small tarn we can see in front of us. We eventually come to a farm track and turn left downhill to the main Coniston road. We cross straight over taking the tarmac track opposite at the National Trust sign for Oxen Fell. We keep following the tarmac track past a farm on the right and the tarmac track becomes a stony track. We keep heading forwards past a footpath sign on the left to meet the small road at Hodge Close. We turn left following the small road through the disused Hodge Close quarries and at Holm Ground we turn right at the end of the building on the right sign posted Tilberthwaite only. We head forwards and follow the yellow across the fields to a stile which we go over and bear left to go over another stile. We head forwards on the path to a track. We turn right down hill then turn left at the footpath sign uphill. We come to a gate which we go through and then follow the stream to the bridge and back to the car park. This is a moderate walk on good paths, tracks and some quiet small roads. There are some slight inclines and declines. Elevation: Approx lowest point 89 m (292 ft) approx highest point 203 m (666 ft). Start point: Tilberthwaite free car park. Tilberthwaite is about 2 miles north of Coniston in the Lake District, Cumbria. From the A66 at Threlkeld take the B5322 on the left. At the t-junction at Legburthwaite turn left onto the A591 by the side of Thirlmere. At Ambleside take A593 following the signs for Coniston. After passing a car park on the left and two farms on the right, go round a sharp left hand bend and take the next right sign posted Tilberthwaite. Follow the road for about three quarters of a mile and the car park is on the left. Parking: Free car park at Tilberthwaite and National Trust pay and display car parks at Glen Mary Bridge on the A593 and at Tarn Hows which has a separate disabled car park. There are public toilets in the National Trust car park at Tarn Hows and also a burger van most days from Easter to October. The next nearest public toilets are at Coniston, where there are pubs and shops for refreshments, and also at Hawkshead.